Scorpius is one of the zodiac constellations, getting its name from the Latin word for scorpion, which is what the constellation somewhat resembles. 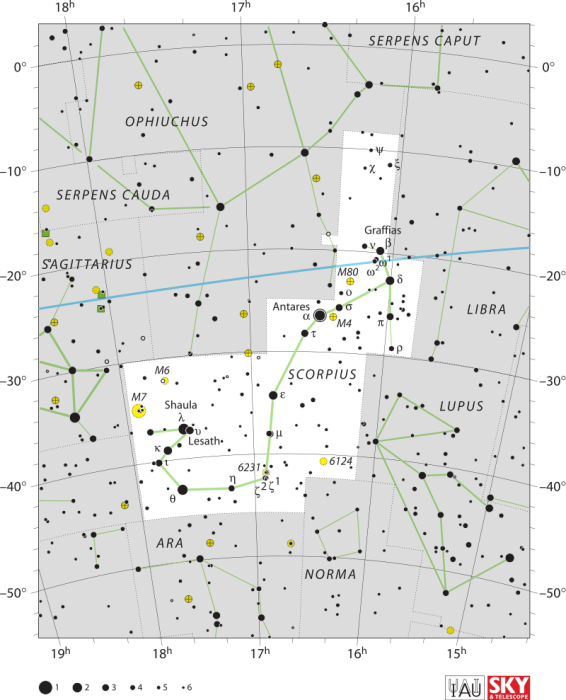 Scorpius is a southern hemisphere constellation, and Sagittarius is found to the east of it while Libra is found to the west. 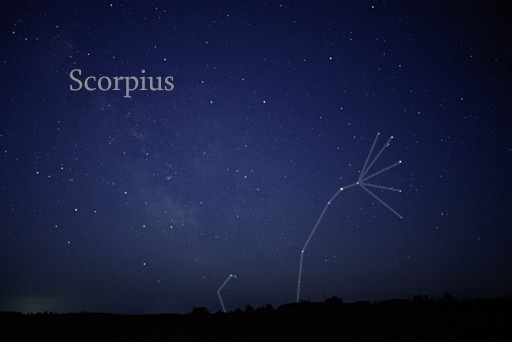 Read on to learn more about the Scorpius constellation, including the stars found in the constellation and the history of the constellation. Several notable exoplanets are found in the constellation on Scorpius, including Gliese 667Cc and PSR B1620-26 b. Exoplanet PSR B1620-26 b is sometimes referred to as Methuselah due to its age. The planet is estimated to be almost 12.7 billion years old. The planet is in orbit around two stars, which means that it is a circumbinary planet. PSR B1620-26 b is estimated to be approximately two times the mass of Jupiter. The stars that the planet orbits are a white dwarf referred to as WD B1620-26 and PSR B1620-26 A. While PSR B1620-26 b is a massive ancient planet, Gliese 667Cc is a planet that, according to the University of Puerto Rico at Arecibo’s Planetary Habitability Laboratory could potentially be habitable. Gliese 667Cc is considered to be a “super Earth”, and the mass of the planet is approximately four times the mass of Earth. The planet is in orbit around a star which is itself part of a three-star system. The star is known as Gliese 667C and it is fairly close to the Earth as far as the size of the universe is concerned, being only 22 light years away from our solar system. The system that Gliese 667C is apart of is home to two other habits that could potentially sustain human life. The planets are Gliese 667Ce and Gliese 667Cf and they are only slightly larger than Earth, about 2.5 times the size of our planet. Astronomers define “habitable” as a rocky planet which is the correct distance from the star it orbits that water could exist on the surface of the planet. There are other considerations for habitability, of course, like the chemical makeup of the planet’s atmosphere. 18 main stars make up the constellation of Scorpius and the most notable stars are Alniyat (two stars share this name: σ Sco and τ Sco), Antares (α Sco), Dschubba (δ Sco), Girtab (ξ Sco), Graffias (β1 Sco), Iclil (π Sco), Jabbah (ν Sco), Lesath (υ Sco), Sargas (θ Sco), and Shaula (λ Sco). Antares (α Sco), is the constellation of Scorpius’s brightest object, and it Is ranked the 15th brightest star viewable in the night sky overall. Because Antares is the brightest in the constellation, it is frequently referred to as being the “heart of the scorpion”. When Antares is seen with the naked eye it has a reddish hue. 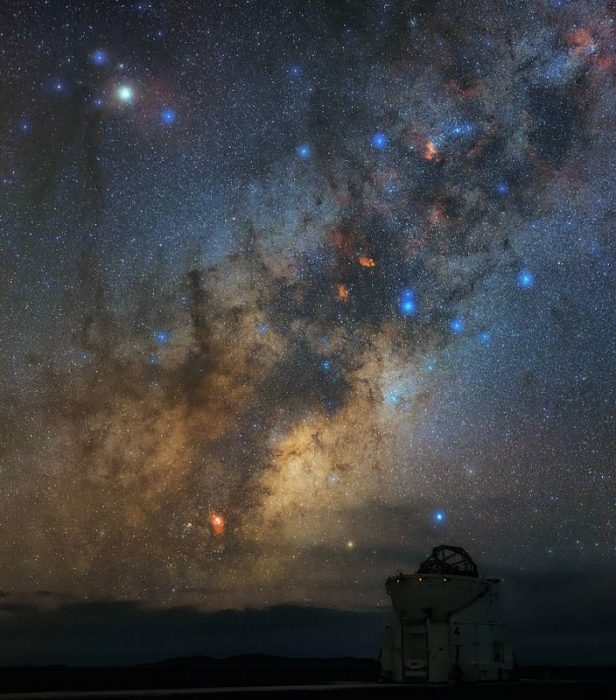 Though Antares is sometimes referred to as a single star, it’s technically a binary star. The two stars which make up Antares are referred to as α Scorpii A and α Scorpii B. Antares is a cool supergiant, a red supergiant. The brightness of the star is around 10,000 times that of our sun, though this only applies to the visual wavelengths of the star. The exact size of Antares is hard to discern, but it’s estimated that if the star was placed at the center of the solar system, where our sun is, the border regions of the star would reach to either Mars or Jupiter. Girtab (ξ Sco), also dubbed Kappa Scorpii, is in the southern portion of the constellation of Scorpius, set on the tail of the scorpion. Kappa Scorpii is a binary star system, and though not as bright as some of the other stars within the constellation, it has a visual magnitude of 2.4 meaning that it is usually seen with the naked eye. The star is approximately seven times the size of the sun, but it has about 17 times the sun’s mass. The temperature of the star is approximately 23,400 K, and at this temperature, the star gives off a whitish blue glow. Dschubba (δ Sco) is the primary component of a binary star system referred to as Delta Scorpii. The star is found on the end of the middle line of the head of the scorpion. Delta Scorpii was at one time it used as a standard for the spectroscopic BO IV classification, though in recent years the star cluster has been considered too variable to serve as a reliable standard. Delta Scorpii A is the primary star in the system, while Delta Scorpii B follows it in an elliptical orbit, orbiting once every 10.5 years. Delta Scorpii A itself is a B class subgiant, and the star is surrounded by a ring of material created by the rapid rotation of the star. Sargas (θ Sco) is a primary component of the Theta Scorpii binary star system. 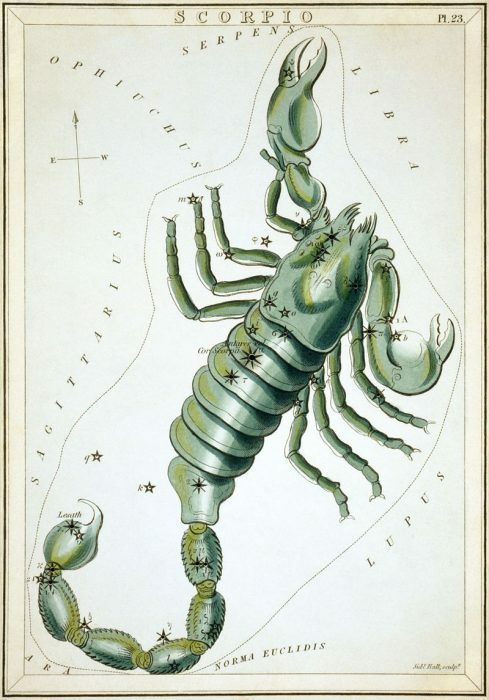 Theta Scorpii can be found where the “tail” of the scorpion begins to curve upwards. The name Sargas is Sumerian in origin. Theta Scorpii A has a stellar classification of F0 II, and it is an evolved bright giant star. Evolved stars are those that are losing mass at low outflow speeds, the mass being shed in the form of stellar winds. Theta Scorpii A (Sargas) has a mass around 5.7 times greater than the sun’s mass, and a radius is which is about 27 times the radius of our sun. The star’s effective temperature is about 7,270 K (the light given off by the star is yellow in coloration), and it radiates about 1,830 times the luminosity of the sun. Iclil (π Sco), Fang and Pi Scorpii Ab are three stars that together make up the triple star system of Pi Scorpii. Pi Scorpii A is made out of two components, Fang (Pi Scorpii A) and Ab. Iclil is the star which makes up Pi Scorpii B. The star system has a magnitude of around 2.9, which means that it can be seen with the naked eye. The two stars in Pi Scorpii A are both hot stars that give off a bluish-white light, with an orbital period of approximately one and a half days. The primary A star is orbited by the smaller B star which has a magnitude of 12.2. Pi Scorpii A has an estimated temperature of around 25,000 Kelvins and gives off a luminosity of 21,900 suns. Graffias (β1 Sco) is the name that applies to the β Scorpii Aa component of Beta Scorpii, though the name used to refer to the entire multiple star system. The β Scorpii Aa star can also go as Acrab. The β Scorpii System has multiple stars within it, including 15 M☉ and 10 M☉ which are the largest members of the entire system and the two components of β Scorpii A. Component Ab of the system has a luminosity of approximately 7,900 and a temperature of 26,400 K. Component B of the system is much more difficult to measure because it is much fainter, though it is estimated to have a mass of around eight times the Sun’s mass. Components B has a similar mass though it has an effective surface temperature of around 24,000 K.
Shaula (λ Sco), or Lambda Scorpii is the second brightest star system within the Scorpii constellation, and it can be found at the very end of the scorpion’s tail. In fact, the name Shaula translates from an Arabic word meaning roughly “raised tail”. Lambda Scorpii is approximately 570 light years away from our solar system, and the system’s age is thought to be between 10 to 13 million years old. It has a luminosity of 36,300 and the mass of the star is around 14.5 times the mass of the sun, with a radius of about 8.8 times the radius of the sun. Lesath (υ Sco), also referred to as Upsilon Scorpii, is a star found at the very end of the scorpion’s tail – it’s stinger. Lesath is around 580 light years from our solar system. The magnitude of the star is 2.7, meaning that it is fairly visible, and along with the star Lambda Scorpii (which has a magnitude of 1.6) the stars form a pair which is occasionally referred to as the Cat’s Eyes. The star’s luminosity is approximately 12,300 times greater than the luminosity of the sun, and it has a temperature of 22,830 kelvins. The mass of the star is around 11 times the mass of the sun, and it has a radius of around 6.1 times the sun’s radius. Lesath translates from an Arabic term meaning “bite of a poisonous animal”. Jabbah (ν Sco) is a component of the Nu Scorpii star system, specifically, it is the Nu Scorpii Aa component. Nu Scorpii happens to be around 470 light years from Earth, and it is made out of at least three different parts: Nu Scorpii A, Nu Scorpii B, and Nu Scorpii CD. Nu Scorpii A is the brightest star system in the entire Nu Scorpii system, with a magnitude of approximately 4.35. Nu Scorpii A is actually three stars itself. Nu Scorpii B orbits A and is part of the AB subsystem. Nu Scorpii B has a magnitude of 5.40. Nu Scorpii CD is a triple star system, much like Nu Scorpii A, and it is made out of a B-type Giant and a couple smaller stars. Nu Scorpii C has a magnitude of 6.90 while D has a magnitude of 7.40. Alniyat (Sigma Scorpii Aa1) is the is part of a spectroscopic binary star system, along with Sigma Scorpii Aa2. Alniyat is one of the brighter components of the Scorpius constellation, with a combined visual magnitude of roughly 2.88. Alniyat has a radius which is about 12 times the radius of the sun and a mass that is about 18 times the sun’s radius. Alniyat also has a luminosity of approx. 29,000 times the sun’s luminosity, and the outer envelope of the star is estimated to have a temperature of roughly 26,150 K.
Scorpius gets its name from Greek mythology. Scorpius was a powerful scorpion sent by the hunter-goddess Artemis to fight Orion, who had claimed that he would kill every animal on the Earth. When the scorpion won the battle with Orion, Zeus put the scorpion in the sky. There are other origin stories for the Scorpius constellation as well. Another story has the god Apollo drafting a scorpion to attack Orion, who had boasted he was better than Apollo. Zeus separated the two fighters, putting them both in the sky, but apart from each other – as they are visible at different times of the calendar year.